The Exigo ISO Lateral Pulldown is part of our market leading plate loaded range. 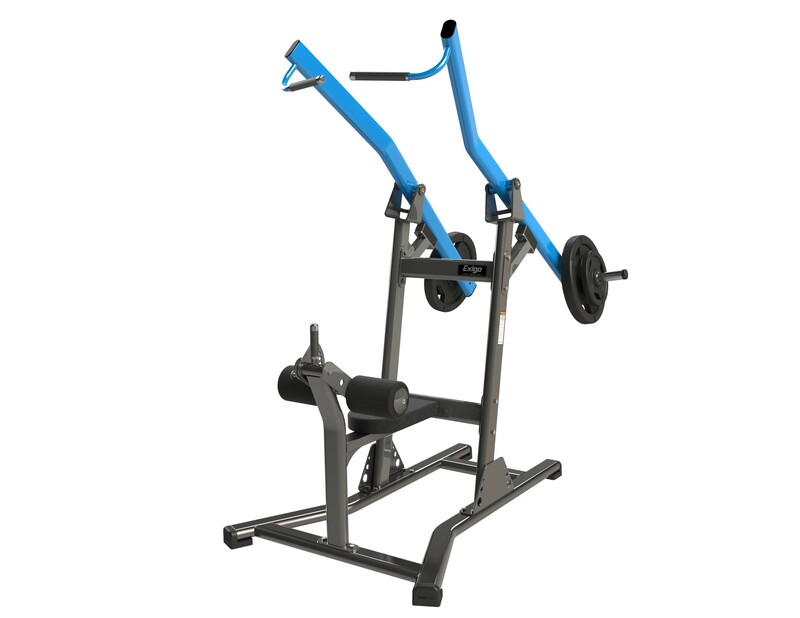 This piece of commercial gym equipment offers an efficient way strengthening the latissimus dorsi. This machine targets and develops the back, shoulders and arms. Complete with padded seat and rollers to provide further comfort and confidence. Additional handle for user stabilisation during one arm exercises. ISO Lateral technology allows users to move both limbs at the same time or individually and also contributes to balanced muscle development, while providing the feel of free weights within a much safer setting. Boasting a durable high quality epoxy powder coated finish, hard-wearing upholstery and a robust frame this machine is a must for any strength and conditioning facility. Engineered using optimal components, the Exigo ISO Lateral Pulldown is great to use due to its smooth movements. The Exigo ISO Lateral Pulldown is user friendly and built to withstand the conditions of a busy gym environment. Proudly designed and manufactured in our very own UK factory with a mainframe lifetime guarantee. Part of our market leading plate loaded range Offers an efficient way strengthening the latissimus dorsi Targets and develops the back, shoulders and arms Padded seat and rollers to provide further comfort and confidence Additional handle for user stabilisation during one arm exercises Allows users to move both limbs at the same time or individually Contributes to balanced muscle development Provides the feel of free weights within a much safer setting High quality epoxy powder coated finish Hard-wearing upholstery and robust frame Engineered using optimal components Great to use due to its smooth movements User friendly and built to withstand the conditions of a busy gym environment Proudly designed and manufactured in our very own UK factory Mainframe lifetime guarantee.